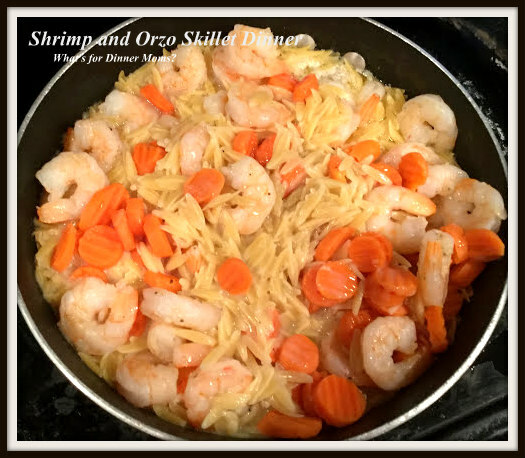 Shrimp and Orzo Skillet Dinner – What's for Dinner Moms? Over the past year we have made Wednesday nights our date night. The local theater has a series of films for $2 that it runs on Wednesday nights for 10 weeks at a time. Each movie, usually an 80s, 90s or early 2000s movie is paired with a craft beer from Grand Rapids, Michigan. Last week we watched “Night at the Roxbury” paired with a fruity Pilsner. We love that movie. The first time we saw it in the movie theater in 1998 we were the only people in the theater. This time we were not. It is the best worst movie! We laughed and groaned at all the references that were “current” then. There was even a line about being out partying with Trump that no one laughed at except the two of us roaring. On those nights I need to make sure that I have really simple dinners so that I can have a meeting, get dinner almost ready, and get to the theater by 7:30 pm. This is one of those meals. I love the skillet one pan dinners. If I can get them started my kids can finish them. This is a twist on the classic dish with peas. We don’t like peas so I took out the peas and substituted carrots. Also, I thought mint sounded strange with carrots so I left that out too. Added a bit more lemon juice and zest and a touch of Parmesan cheese. The kids really liked this and it was super simple to make! Serve this with a hearty green spinach salad and you have a delicious dinner! Add oil to a large pot or skillet heat over medium-high heat 1-3 minutes or until shimmering. Combine salt, black pepper and sugar in a bowl then add shrimp and toss to coat. 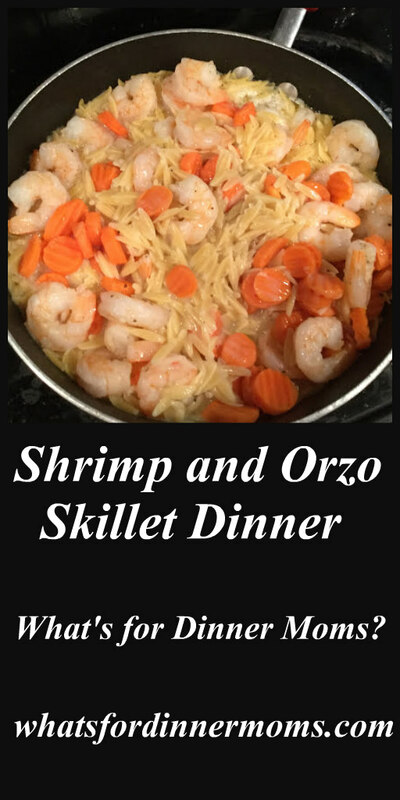 Arrange shrimp in a single layer over bottom of Skillet and cook about 1 minute or until one side is browned and edges are curling. Remove Skillet from heat and turn shrimp over and let sit until centers are warmed through. Remove shrimp from Skillet, set aside. For orzo, in same Skillet, combine orzo, garlic, broth and clam juice. Bring to a boil; cover and reduce heat to medium-low. Cook 10-12 minutes or until orzo is cooked through. Remove Skillet from heat and stir in carrots, butter and lemon juice. Arrange shrimp over orzo; cover and let stand 3-5 minutes or until heated through. Sprinkle with lemon zest and additional black pepper. Ahhh, this sounds like a dish for me!! I just tell my family it is baby pasta. It works. Haha. I love it. What’s the best way to cook it? Do you cook it like regular pasta? Orzo is pasta just that it looks like large grains of rice. To some it looks weird but it is pasta. It must be so tasty!